The Australian Biome Project would create another significant tourism drawcard on the Burswood Peninsula. A $650 million development proposed to be built on the Burswood Peninsula promises to solve the fundamental problem with Western Australian tourism by bringing the state’s most unique indigenous experiences and natural attractions to the inner city. Unveiled to the public this week, the Australian Biome proposal would reduce the need for visitors to travel long distances to experience the state's best attractions. Drawing inspiration from the Eden Project in Cornwall and Singapore's Gardens by the Bay, the proposal comprises three large dome structures showcasing the unique climates and biodiversity of WA, with each dome connected by gallery walkways and virtual reality theatres which will display Dreamtime creation stories, traditional lifestyles and Aboriginal art. 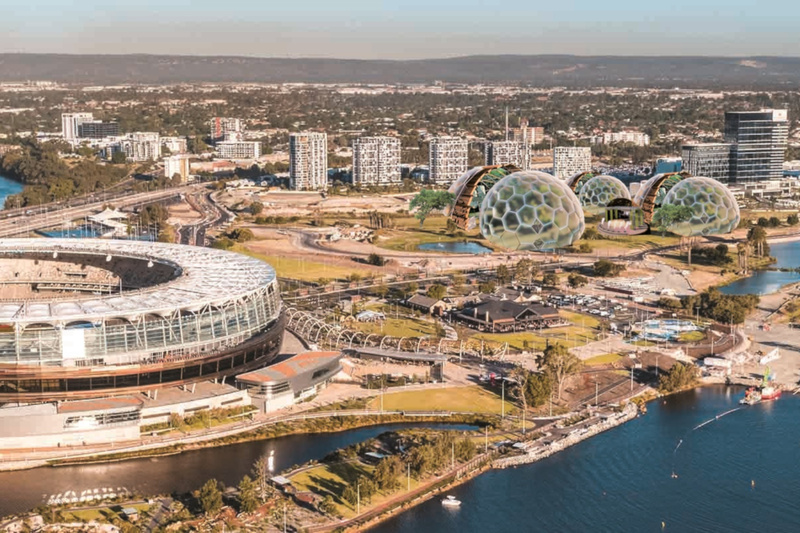 Media projection and LED lighting will be utilised to simulate the six seasons of the Nyoongar calendar inside the domes, while a 1.3 kilometre elevated walkway will link the project to Optus Stadium, Crown Perth and transport infrastructure. The proposal also includes an amphitheatre for concerts and performing arts, walk trails and sculpture installations. Australian Biome chair Terry Dewar, who has been developing the concept for several years, said the project had been embraced by Aboriginal elders across the state. “In a nutshell, it’s the oldest culture in the world meeting the latest technology,” Mr Dewar told Business News. “We have been engaged by every Aboriginal group, right across the state, which is really good. “For 60,000 years, this is the first time they’ve decided to work together. “They’re excited because the project is about sustainability, it’s about recognition and it’s about sharing of culture. “Aboriginal people are about sharing culture and sharing what their knowledge is. “They just haven’t had the platform to be able to do that properly across the board in a sustainable, commercial-type environment. Mr Dewar said the Australian Biome Project team had been working closely with the state government, with Tourism Minister Paul Papalia recommending the Burswood Peninsula as the ideal place for the project’s development. He said the biome model would provide international visitors to Perth a unique window into Australian indigenous culture, with all edible plants grown in the biodomes to be utilised in a range of restaurants and food outlets incorporated in the development. All food products at the Australian Biodome would also engage indigenous businesses throughout the supply chain, Mr Dewar said. “By creating this biome model, first and foremost it connects the environment with Aboriginal culture,” he said. “To understand how Aboriginal people have lived and survived for 60,000 years is to understand the culture. Project spokesperson Adam Barnard, who recently sold his stake in WA's largest tour operator, ADAMS Group, and had intended to retire until presented with the opportunity to be involved with the Australian Biome team, said the project would be a significant boost to WA tourism. “It’s like nothing we’ve ever seen before, there’s been a lot of talk lately about tourism, and it’s been about 25 years since we’ve had a significant tourism development,” Mr Barnard told Business News. “There are a lot of smaller things that are getting knocked back continuously, but if we want to really activate the state or diversify the economy, then we’re going to need a large attraction. “We have problems keeping people entertained for long enough while they are here, because they just can’t get to the regions in the timeframe that they have. “If you look at an Asian visitor, five days is the most you’re going to get out of them, which is not enough time to get them to disperse, but then there are not enough things for them to do in Perth. “What we are proposing to create is on a global scale and an attraction that can actually, in its own right, attract people to Perth. Mr Barnard said the biome would be funded entirely by the private sector, with the state government helping to facilitate its development and also to provide the Burswood Peninsula land. “Given the economic return that this would provide for the state, this would be an extraordinary multiplier," Mr Barnard said. Mr Barnard said the Australian Biome team had been in contact with several parties interested in contributing to its development cost. “We are already in contact with businesses such as Google, Elon Musk, those contacts have already been made,” he said. “If we build it, every single person in this state will benefit from the jobs that will be created. “There would be a significant amount of economic activity if we build something that’s world class, everyone in business would benefit from this infrastructure. It was only after we moved to the Kimberley that my children were introduced to the indigenous story times at Broome Senior High School. It was inspiring to see them embrace the history of this land that we share. While a worthwhile concept, $650 million is ridiculous. This needs to be scaled down to something reasonable that achieves its objectives. It’s our money some bureaucrat is spending. Michael, as mentioned in their article, this will be privately funded. The government won’t be involved in the $650 million costs. It will just supply the land and authorisation to use the land. I doubt any land development costs would be as high. Besides, if we want something amazing we need to spend the money. If the private sector is willing to invest that much in Perth, I encourage it to do so. Perth will get nowhere if the attitude is always 'scale it back'. A great idea to add to the list of attractions for tourists who have limited time. Residents of the peninsula are just recovering from years of disruption and life impact from the construction of Crown Towers and the Perth Stadium and now it is proposed to ignore us again. The impact of previous works has been to reduce the value of residents' properties greatly. We are already looking at a huge tower block to be built next to existing towers. Infrastructure is incapable of handling parking and through traffic now – just add some more. This has more to do with financial opportunism than tourism and indigenous partnership, they are the excuses. Expect a fight. It is honestly such a pity that Perth continues to demonstrate such poor attitudes to these amazing development proposals. The continued activation of the peninsula was announced a long time ago. Not only around the race course, but towards Crown as well. In other words, all residents should be expecting continued infrastructure and development. In this case, the development would not just be for profit likes Crown Towers, it is also for the Aboriginal community and businesses as well. To believe otherwise is just misplaced fear speaking. I, and many others, will fight to ensure this development happens. After all, it is being built on an ideal piece of land. Everyone within it shouldn't be surprised by efforts to bring Perth into the 21st century. I have no issue with the concept but why put everything in the one area? This will simply add to the existing congestion problems the peninsula area has, and will have with the sixth residential tower and the proposed 30-storey tower west of the casino car park corner of Vic Park Drive and Bow River Crescent. Why would this not be looked at on the river parkland south of the Causeway towards South Perth? It would make that side a lot more attractive than it is now and with little impact to residence. Can I also suggest that maybe the best location for this project considering its outlining the Aboriginal culture would be Herrison Island in the centre of the Causeway. Over the years we have had Aboriginal protests at this site in regards to it being of great cultural significance, so whý not honor their past there? I am all for creating attractions for locals and especially tourist, but why locate every feature in the one area, spread it out around this beautiful city and give the hop-on-hop-off bus more significant stops adding to the experience?